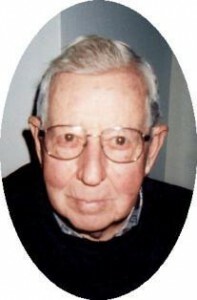 Killian H. Bode, Sr., 89, of 154 E. Prospect Street, Port Washington died peacefully Tuesday, February 22, 2011 at the Harbor Cove in Port Washington. He was born on May 1, 1921 in town of Port Washington to Adolph and Margaret Greiveldinger Bode. He attended St. Mary’s Catholic School in Port Washington and worked the family farm. On May 8, 1943, he married Mildred Bittner of Belgium at St. Mary’s Catholic Church in Lake Church, Town of Belgium. After leaving the family farm, he and his family moved to Port Washington. Over the years he was employed at AO Smith Corporation in Milwaukee as a crane operator and Jacque Welding and Crane in the Town of Port Washington. He delivered home heating oil for Ozaukee Oil Company of Port Washington for quite a number of years while driving City Bus part-time, operating a landscape business and hearse driver for the Poole Funeral Home. He later did maintenance for the Ozaukee County Courthouse in Port Washington, retiring in 1983. He was always busy even in retirement and was a crossing guard in Port Washington for 10 years. For many years he operated B&B Lawn Care. When he was not in his pickup truck, he would be driving his tractor. He took great pride in his work, maintaining Stony Hill School, Port Washington State Bank of Fredonia and the Fredonia Post Office, amongst many others. He was a regular at Harry’s Restaurant for many years. He enjoyed woodworking, snowmobiling, heading out on a gambling junket and his Beech Nut. He will always be remembered for his love of family, his big heart to always help someone in need and his drive of excellence. He is survived by his wife of 67 years Mildred, daughter Mary Margaret (David ) Decker of the Town of Belgium, two sons Vernon (Donna) Bode of Fredonia and Killian Jr. (Judy) Bode of Atlanta, Georgia, 7 grandchildren, 10 great-grandchildren, brother Hilbert Bode of Milwaukee, nieces, nephews, other relatives and friends. He is preceded in death by his brother Curtis Bode. A Mass of Christian Burial will be celebrated at 7:30PM Friday, February 25, 2011 at Holy Rosary Parish-Holy Cross Chapel, 2330 County Highway B in Holy Cross, Town of Belgium. Reverend James Ernster will be the celebrant. Family will receive friends from 3:30-7PM with a rosary at 3:30PM AT CHURCH. Interment will take place at St. Mary’s Catholic Cemetery in Port Washington.